Write the Arizona Corporation Commission about the upcoming rate case to support the growth of solar in our state and not undermine the viability of residential rooftop solar. Our new member, Marty Landa with Inspiration of Sedona, has brought us important insight on the upcoming Arizona Public Service rate case. As a group, our members discussed the issues and what we believe is best for the future of Arizona. Here are the four issues you should be concerned about, along with what we recommend you write the ACC to do as an alternative. Below these 4 bullet points, we have provided additional background information. DOES APS EVEN NEED A RATE INCREASE? According to the Arizona PRIG, APS may not need a rate increase. Prior to the rate case, the Arizona Corporate Commission staff and the Residential Utility Consumer office concluded that APS did not need to increase rates. What changed? TELL THE ACC: The ACC should carefully examine whether APS truly needs to change the rates at all. THIS WILL UNDERMINE ROOFTOP SOLAR INVESTMENTS AND JOBS. The structure of the new rates and rate structure may impede our progress toward renewable energy and in particular, they undermine the economics of residential solar. Solar and battery technologies are advancing quickly and maintaining that market will help Arizona switch to renewable energy in the long run. It's also a good source of local, living wage jobs. TELL THE ACC: Reinstate net metering or build in other incentives to ensure that rooftop solar continues to have a reasonable rate of return. Solar customers should be allowed the same rate of return on their invested capital as the ACC allows APS and the value should be based on 20 years, not an artificially short time frame. THE PLAN OPTIONS ARE UNFAIR. The requirement to choose a time-of-use or demand-charge rate plan at the beginning of service is not reasonable. How can homeowners know which plan will be best until they have a little data? Why force them into one of these complicated plans and make them wait for 90 to opt into the flat rate plan most people are comfortable with? Does the average homeowner really want to become a sophisticated energy manager? TELL THE ACC: Instead, everyone should be able to choose a flat rate plan at the outset and change plans whenever they want to. THE LONG-TERM GOAL IS A JOKE. The Renewable Energy Standard is woefully inadequate to incentivize action. APS has virtually achieved the goal for 2035, a pitiful 15 percent. We can do a lot better. Twenty-five cities have committed to be powered by 100 percent renewable energy and the US Conference of Mayors recently launched a new national initiative with that goal. The Solutions Project has shown a plan for each state to achieve 100 percent renewable by 2050; see their recommendation for AZ below. 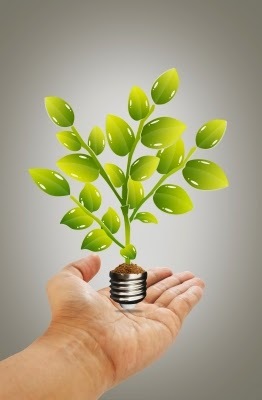 A number of major corporations are already getting 100 percent green power. With all our sun and other resources and with technological progress, this is an achievable goal. Imagine what the cost of climate change will be if we don't do this. TELL THE ACC: The Renewable Energy Standard should be increased to 100% renewable energy by 2050. "The rate increase APS is seeking is unjustified, the 87.5 percent increase to the monthly mandatory charge is unwarranted, and the right for APS — not new customers — to determine what rate plan is best for them for the first 90 days is unconscionable. 2. THE NEW RATE STRUCTURE UNDERMINES THE ECONOMICS FOR RESIDENTIAL SOLAR. Net metering, where a kWh a customer generates is considered equal to one they get from APS at night, has been eliminated as policy already by the ACC. They voted but this has not been finalized until the rate case. The plans are to drop significantly the amount solar customers will get for their energy and there is no predictability. The amount solar customers will be paid for their energy is only set for 18 months and expected to drop even more after that. Many believe net metering has been key to making solar pencil out for customers. With Federal tax credits, solar usually has a 8-12 year payback period. Since people in the US move on average about 7 years, this is already a tough decision if made purely on financial grounds. The main incentive for the utility to promote residential solar is mostly PR and the potential to avoid building another power plant. But utilities are paid an 'allowable return' on capital (ie, their plants and other infrastructure), particularly generous percentage in the case of APS. If they don't own the solar, they don't get the return. And large solar arrays are cheaper per kWh. In a nutshell, it's more advantageous to APS to build their own, large solar farms, and in the long run, perhaps cheaper for customers. That said, the industry is changing rapidly. With developments like Tesla's roofs and battery packs, rooftop solar may end up being a large percentage of our future mix. If the rate structure is driving APS to want to own all the infrastructure, change the rate structure. If individuals are willing to put up a lot of the capital for Arizona to move toward 100 percent renewable energy, don't stand in their way. Under the Arizona Renewable Energy Standard (RES), which the Arizona Corporation Commission (AAC) adopted in 2006, we’re required to supply an increasing percentage of retail electric energy sales from renewable resources. This percentage increases annually until it reaches 15% in 2015. 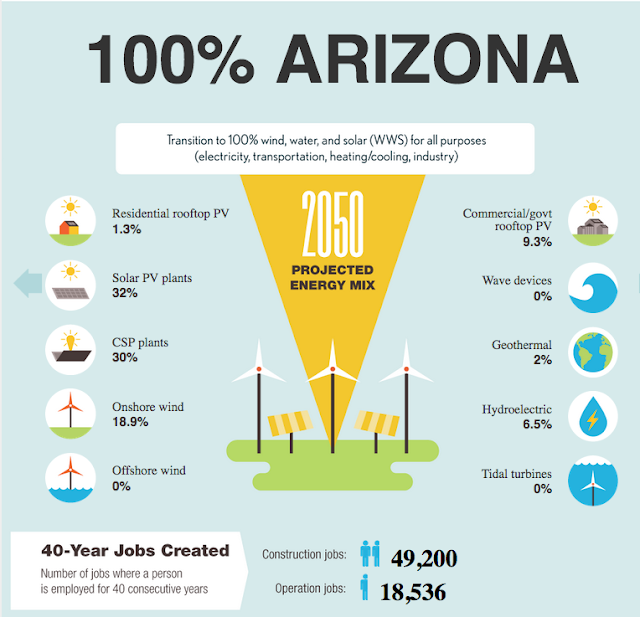 While The Solutions Project, which has developed a plan for each state to be 100% renewable using existing technologies, shows Arizona should set these as goals (below), which would add close to 70,000 jobs. 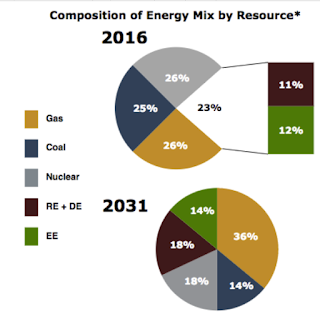 Note that rooftop solar is still a small percentage in their projections but large solar and concentrated solar projects would represent over 60% of our energy production. We believe that The Solutions Project energy mix targets for rooftop solar may be far too conservative. They have not kept abreast of new technologies (like Tesla's solar roof and batteries). Since the utility is allowed to get a specified rate of return on its capital investments, why not build solar rates so that homeowners get a similar return until the direction of the solar and storage industry becomes more clear. "The rate increase APS is seeking is unjustified, the 87.5 percent increase to the monthly mandatory charge is unwarranted, and the right for APS — not new customers — to determine what rate plan is best for them for the first 90 days is unconscionable," said Diane Brown, executive director of Arizona PIRG, a public interest group. Brown noted that initially, both the Corporation Commission staff and Residential Utility Consumer Office concluded APS didn’t need to raise rates at all. The deal will allow solar customers to avoid demand rates for 20 years from the date of their interconnection if they apply for solar before a decision in the case. People who install solar after new rates take effect will see several changes that reduce the savings they see from their rooftop investment. Solar-industry representatives said the plan isn’t ideal, but it will allow solar installations to continue in APS territory, rather than shut them down, which is what happened in SRP territory after it made more dramatic changes in recent years. Arizona Public Service Co. agreed to accept a rate-hike request of $6 a month on average instead of the $11 it was seeking. The agreement between the state's biggest utility and a majority of parties in the case must be approved by utility regulators. Thirty of the 40 parties in the case, including Corporation Commission staff and the Residential Utility Consumer Office, have agreed to the settlement, which covers all APS homes across all seasons. The settlement also calls for optional "demand charges" rather than mandatory demand charges APS sought for most residential customers. Demand rates would charge less for each kilowatt-hour of electricity a customer uses during the month. But they also single out the highest one-hour use of electricity during peak hours in a month and assess a fee based on how high that hourly demand reaches. kph per month on average. Basic Service Charge $10. distributed generation using 1,000 kph per month or more on average. to another rate for which they are eligible. R-2: Available to all customers. Basic Service Charge $13. to voluntarily move to another rate for which they are eligible. i. An Optional R-Tech Pilot Rate Program shall be created that will initially serve up to 10.000 customers. Once 6,000 customers have signed up to take service under this program, and if such threshold has been reached prior to the Company's next general rate case filing, the Company shall provide notice and promptly convene a meeting of the interested parties to this Docket to discuss the future of the Pilot Program. If each of the parties to that discussion agree on a new customer participation level for the R-Tech Pilot Program that shall apply until the Commission determines the disposition of the R-Tech Pilot Program during the Companys next general rate case the Company shall file a notice in this Docket to that effect and the program shall continue to be ottered up to the new agreed upon customer participation level. However, if all parties cannot agree to a new customer participation level. then APS shall tile a report on the R-Tech Pilot Program and request that the Commission determine whether to continue, expand. or terminate the program in the Docket within 90 days of the date that 7,000 customers have begun taking service under this program. The Commission will then promptly review the program and determine if it should continue. terminate, or be adjusted. ii. The Parties have agreed to a rate design for the R-Tech Pilot Rate Program as set thanh on Exhibit A attached hereto. h. The TOU on peak period will be 3:00 p.m. to 8:00 pm. weekdays for TOU-E, R-2, R-3, R-Tech and XS General Service. 2) RateAvailabilitv.AllcustomersmayselectR-Basic,R-BasicLarge,TOU-E.R-2,orR-3. including R-Tech or R-XS if they qualify, until May l. 2018. except to the extent grandfathered under other sections of this Settlement Agreement. Distributed generation customers will not be eligible for R-XS, R-Basic or R-Basic Large. After May l, 2018, R- Basic Large will no longer be available to new customers or customers who are on another rate. New customers alter May 1, 2018 may choose TOU-E. R-2, R-3 or if they qualify R- XS or R-Tech for 90 days. Alter 90 days new customers may opt-out of their current rate and select R-Basic if they qualify. Customers transitioning to R-Basic must stay on that rate for at least 12 months. A BIG WIN FOR SOLAR IN NEVADA! -- And why you need to make your voice heard on the upcoming APS rate case here in Arizona! We had some incredible news a few weeks ago. The Nevada state legislature voted to reinstate solar net metering (which is essentially the same thing as voting for residential rooftop solar) and bring back companies like SunRun and Tesla to the state. The decision was the result of consumer demand and pressure brought on by Years of Living Dangerously and other media outlets. Some may recall that Season Two’s premiere episode we showed (starring Cecily Strong of SNL fame) was about the fights taking place over rooftop solar, specifically in Nevada and Florida, where, incidentally, a pro-solar bill awaits the governor’s signature; if signed, homeowners would have a much easier time going solar in the Sunshine State. Please write the Arizona Corporation Commission about the upcoming rate case and urge them to support the growth of solar in our state and not undermine the viability of residential rooftop solar.